Excerpt from Guilt By Association—How Deception and Self-Deceit Took America to War (2008) State Street Publications, pp. 77-101. Rather than engage the Russians, John McCain seeks to enrage them. In May 2006, he and Joe Lieberman sought to embarrass President Vladimir Putin by calling for a U.S. boycott of the July 2006 G-8 summit of industrial nations. That meeting was convened in Putin’s hometown of St. Petersburg, an historic showcase newly refurbished by the Putin government and a city where he served as deputy mayor during the reform era of Mikhail Gorbachev. In an effort, coordinated with the late Congressman Tom Lantos, to discredit Putin, McCain portrayed as a “political prisoner” Mikhail Khodorkovsky, the most infamous of Russia’s corrupt oil oligarchs. When, without further explanation, he also charged that the indictment of Russian media oligarchs Boris Berezovsky and Vladimir Gusinsky was “politically motivated,” it became clear that the candidate was either ignorant about—or complicit in—Russian organized crime. As Russian media moguls in the 1990s, Berezovsky and Gusinsky played critical roles in rigging the 1996 re-election of President Boris Yeltsin. During Yeltsin’s first term as president, a handful of Ashkenazi oligarchs financially pillaged Russia’s post-Soviet economy under the guise of Glasnost (openness) and Perestroika (restructuring). Russia’s “Big Seven” oligarchs invested an estimated $500 million in Yeltsin’s re-election, enabling them to hold onto privatized assets long enough that public assets stolen from the Russian people could plausibly be portrayed as private and hence subject to the protection of post-Soviet law. Six of the “Big Seven” qualify for Israeli citizenship. This chapter identifies the syndicate operatives that a McCain presidency would protect at the risk of U.S.-Russia relations—and to the great detriment of the Russian people. Though Boris Berezovksy frequently travels to Tel Aviv with an Israeli passport, he resides in London where he enjoys political asylum—a status Moscow aims to see revoked. Gusinsky relocated to Tel Aviv from Moscow where he was a vice-president of the Bronfman-led World Jewish Congress and chairman of the Russian Jewish Congress. By the time oil oligarch Khodorkovsky was jailed for fraud and tax evasion, his lieutenant Leonid Nevzlin had already fled to Israel to escape an arrest warrant on charges that he organized a series of contract killings from inside Yukos, a Russian oil company over which he and Khordorkovsky gained control in 1995 in a Yeltsin-era fraud known as “loans for shares.” When he fled Russia, Nevzlin was also the sole beneficiary of a trust that controlled voting rights in Yukos. When Moscow sought his extradition, Tel Aviv refused. Until his October 2003 arrest, Khodorkovsky was actively discussing his planned presidential campaign in which he would have invested a portion of his massive oil wealth. Had he succeeded (quite likely given the Ashkenazi-oligarch control of Russian media at the time), he would have gained political control of a nation that he had already financially plundered in partnership with a network of predominantly Ashkenazi operatives. Though campaigning for president on his national security credentials, McCain has misdiagnosed issues of profound consequence not only to ordinary Russians but also to Americans systematically defrauded by the same transnational syndicate. With regularity, the candidate has favored those complicit in the criminal network chronicled in this account. Thus the skepticism with which Moscow must have viewed John McCain’s May 2008 campaign proposal for a new arms pact with Russia. This chapter also describes the modus operandi by which Russia was looted by organized crime operatives sharing the same ideological bias as those operating in the U.S. In addition to chronicling a U.S. presidential candidate’s relationship with this syndicate, this chapter also describes the suspect political dynamics behind the “Orange Revolution” in Ukraine. The consistency with which John McCain has associated with this transnational network raises the sensitive issue whether his candidacy enjoys syndicate support. To claim that Khodorkovsky is a “political prisoner” requires a closer look at how, at 32 years of age, a single Russian-Ashkenazi citizen amassed state-owned assets worth more than $30 billion. A description of this politically facilitated fraud demonstrates just how few well-placed operatives are required to sustain this criminality across borders and across generations. Bank Menatep, founded by Khodorkovsky in 1990 when he was 27, pre-staged the fraud used to gain a controlling interest in Yukos, which was privatized in 1995. In 1993, Khodorkovsky became deputy to Vagit Alekperov (aka “the Don”) who was then minister of fuel and energy charged with reorganizing the Russian oil industry for privatization. After brokering corrupt transactions between bureaucracies and industries, Menatep emerged as a conglomerate of Khodorkovsky-controlled enterprises. Under the 1995 “loans for shares” scheme, the cash-strapped Yeltsin administration pledged shares in state-owned oil companies to oligarch-controlled banks as collateral for loans to the government. When the government defaulted on the loans, the oil company shares were “auctioned” to the oligarchs by the same oligarch-controlled banks. Participation in the auctions required not only an invitation, typically by seeking approval from Yeltsin’s daughter, Tatyana, but also a registration approved by oligarch-owned banks. Bank Menatep managed the Yukos auction, enabling Khodorkovsky, Nevzlin and their partners initially to take control of Yukos by acquiring 45% of its shares for $159 million with 11.5 billion barrels of proven reserves—less than three cents per barrel. Two years later, Yukos was listed on the Moscow stock exchange at a value of $7 billion. By 2004 its value topped $34 billion. Even the funds used to bid in the government auctions came largely from the government. Favored banks (owned by the oligarchs) were given loans by the central bank at negative interest rates, and government funds were kept on deposit at below-market interest rates. Not only were the banks also allowed to seize profits of certain Russian traders and avoid paying tax on their windfalls, but they could also participate in the government bond market where annualized yields ranged from 60 to 200 percent in dollar terms, 1995-98. His marriage to Polina V. Yumasheva, the daughter of a presidential speechwriter to President Yeltsin, Valenin Yumasheva, was the closest to a dynastic wedding in the new Russia…. Eighteen months after they were married, Mr. Yumasheva married Mr. Yeltsin’s daughter Tatyana, making Polina the stepdaughter of Mr. Yeltsin – and Mr. Deripaska a member of the Yeltsin family through marriage. Sibneft, another major oil company, owned reserves equivalent to Texaco before its merger with Chevron. The shares of Sibneft sold at auction for $100.3 million to Yeltsin insiders Roman Abramovich and Boris Berezovsky. Known as the “Grey Cardinal” and “The Godfather of the Kremlin,” Berezovsky introduced Abramovich to Yeltsin’s inner circle and later sold out to him when Berezovsky fled to London in 2000 to escape fraud and embezzlement charges brought by the Putin government. Like other oligarchs, Abramovich also began his criminal career with corrupt export schemes that acquired state-owned commodities at low state prices and sold them abroad at far higher prices. These early oligarchs (operating as the people in between) exploited that difference to amass fortunes across an array of commodities. Abramovich and his mentor, Boris Berezovsky, specialized in the theft of oil and aluminum. In 2004, Abramovich sold his stake in Russian Aluminum to Deripaska. In its 2008 listing, Forbes ranked Abramovich, age 41, the world’s 15th richest billionaire with personal wealth of $23.5 billion. In February 2008, The Moscow Times estimated Deripaska’s wealth at $40 billion placing him, at age 40, among the world’s top 10 billionaires as rising prices for oil and metals boosted his net worth (Forbes ranked him ninth in 2008 with wealth of $28 billion). Without explanation, Forbes describes as “self-made” the vast fortunes amassed by Russia’s oligarchs in a process that senior Forbes editor Paul Klebnikov characterized in 2000 as “the biggest disaster (economically, socially and demographically) since the Nazi invasion of 1941.” In early 2008, 74 billionaires lived in Moscow. With an average wealth of $5.9 billion, the Russian capital eclipsed New York City as home to the world’s greatest number of billionaires. In both cities, the billionaire population is predominantly Ashkenazi. In July 2004, Klebnikov, then editor-in-chief of Forbes Russia, was murdered as he left his Moscow office. He had just published a profile of Russia’s Top 100 richest featuring many of the newly rich who would be hard pressed to explain how they legitimately acquired their self-made fortunes. The subtitle of Klebnikov’s 2000 book, Godfather of the Kremlin, captured the scope of the criminality that John McCain defends: Boris Berezovsky and the Looting of Russia. McCain charged that Putin’s opposition to the oligarchization of Russia is “a creeping coup against forces of democracy and market capitalism.” By associating the stature and authority of his position as a U.S. Senator with opposition to the indictment of Berezovsky and Gusinsky, McCain helped dash the dreams of ordinary Russians who aspire to be governed by the rule of law rather than by oligarchs and the rule of in-laws such as Deripaska. To restore a credible legal system after looting on such a scale requires leaders willing to expose those who defrauded the Russian public by inducing belief in the corrupted authority of law. According to The Washington Post, McCain campaign manager Rick Davis twice arranged for the candidate to meet with Oleg Deripaska whose links to organized crime are sufficiently compelling that a visa to visit the U.S. was revoked in July 2006. Their first encounter was arranged at the annual World Economic Forum in Davos, Switzerland in January 2006. They met again in Montenegro seven months later during an official U.S. Senate trip to that eastern European country. Fields within Fields. On March 20, 2008, after John McCain secured the Republican nomination for president, Nathan Rothschild and his father, Lord Jacob Rothschild, sponsored a fundraiser for McCain in London. A principal adviser to Oleg Deripaska, Nathaniel is a descendent of Nathan Mayer Rothschild who helped finance Britain’s victory over Napoleon at Waterloo. In addition to providing financial advice to the Russian oligarch on the aluminum giant Rusal, Nathanial Rothschild also advises Indian steel magnates. Along with the Big Seven oligarchs, Berezovsky and Gusinsky donated the money and media time required to re-elect Yeltsin in 1996. Also known as “Russia’s Rupert Murdoch,” Gusinsky launched Sevodnya, a newspaper that threw its unqualified support behind Yeltsin’s presidential campaign. Yeltsin promptly rewarded Gusinsky with Russia’s first private television network (NTV). That key asset anchored Gusinsky’s creation of a media conglomerate that included print, radio and television. Roman Abramovich became a business partner of Yeltsin’s son-in-law, Leonid Dyachenko, and also served on the board of Sibneft, Berezovsky’s primary oil holding. Soon after Putin succeeded Yeltsin as president on New Year’s Eve of 1999, Berezovsky sold to his protégé Abramovich his interest in Signeft (oil) and ORT, Russia’s largest television network. Abramovich promptly conveyed ORT’s voting rights to Vladimir Putin. In 2003, Abramovich purchased Chelsea, Britain’s leading soccer club, for $300 million and has since reportedly spent $500 million on player transfers. In addition to his lavish home in Moscow, his six-story house in London’s Eaton Square, formerly part of the estate of the Duke of Westminster, is reported to be worth more than $46 million. With proceeds from their plundering, Russia’s criminal elite now own an estimated one in five homes in London’s posh Mayfair district. In September 2005 Abramovich cashed out a 73% stake in Sibneft in a $13 billion sale to Gazprom, Russia’s state-owned energy conglomerate. He owns multiple mansions and at last count three mega-yachts of more than 300 feet in length with two more under construction, including Eclipse, a super luxury yacht that measures more than 525 feet, the world’s largest. In April 2008, the Kensington and Chelsea council approved plans for Abramovich to build the United Kingdom’s most costly residence at an estimated expense of £150 million ($298 million). The eight-bedroom mansion is expected to be eight floors, three of them underground. In July 2008, he announced the purchase of a villa on the French Riviera for $500 million to honor his upcoming marriage to model Daria Zhukova, 25. The estate requires a full-time staff of 50 gardeners to maintain the grounds. Though he resides primarily in London, Abramovich saved an estimated $1 billion in Russian taxes by investing several hundred million dollars in Russia’s Far East region of Chukotka. Impoverished residents call the young Ashkenazi oligarch a “messiah” for lavishing a portion of his stolen wealth on their destitute region where he served as governor from 2001 until recently. His grateful constituents may not realize that his political status protected him from prosecution in Russia. In November 2005, he was sworn in for a new five-year term but resigned in July 2008. Abramovich attends services in Russia of the Orthodox Lubavitch Hassidic movement headquartered in Brooklyn, New York—the Jewish equivalent of fundamentalist evangelical Christians. Abramovich provided funding for Italian-American Rabbi Berel Lazar who relocated to Russia in the early 1990s to promote the Lubavitch movement. In June 2000, one day after meeting with Putin in the Kremlin, Lazar convened a meeting of Hassidic rabbis and their emissaries from 45 Russian regions where they voted Lazar chief rabbi of Russia, replacing Adolph Shayevich, a rabbi recognized by the World Jewish Congress. Lazar’s position was arranged by Putin (reportedly advised by Abramovich) so that the Russia government could bring corruption charges against media czar Gusinsky without being subjected to the charge of anti-Semitism, damaging Russia’s reputation in world affairs. As head of the Russian Jewish Congress (to which Gusinsky made a $10 million annual contribution), the Gusinsky case had to be handled with care. Once Rabbi Lazar became chief rabbi, there was less concern that pursuing Gusinsky would provoke that charge. Gusinsky relocated to Spain and then to Israel where he remains. Putin invited Lazar to a special dinner at the Kremlin during the January 2001 visit to Moscow of Israeli President Moshe Katsaw. A special cleansing (koshering) of the Kremlin kitchen was ordered for the first time in Russian history. To escape charges of anti-Semitism, Putin pit two Jewish factions against one another. Yet he also exchanged the (relative) moderates of the World Jewish Congress for extremists of an Orthodox Hassidic sect known to enjoy financial support from at least one of Russia’s richest oligarchs. When Gusinsky fled to Israel, his NTV television station was taken over by Gazprom, the state gas monopoly led by Dimitri Medvedev until his March 2008 election to succeed Putin as president. During his heyday in Moscow, Gusinsky maintained a close relationship with Yuri Luzhkov, an Ashkenazi khozyain (boss) appointed mayor of Moscow by Yeltsin in 1992 and since elected three times. Luzhkov helped Gusinsky gain control of Channel 4, a major Moscow television station, as well as other media properties. Gusinsky, in turn, helped re-elect Luzhkov who designated Most Bank, controlled by Gusinsky, the primary bank for financing Moscow real estate projects and infrastructure. When Luzhkov became mayor, Elena Baturina emerged as a key beneficiary of Moscow construction contracts. By 2007, her net worth of $2.3 billion ranked her 335th on the Forbes 2008 list of the world’s billionaires. Baturina is Luzhkov’s wife. Gusinsky now divides his time between Tel Aviv and Joe Lieberman’s home state of Connecticut where he maintains a home in the upscale town of Greenwich. Gusinsky and Luzhkov toured the U.S. together, meeting with their American counterparts who wanted to enter the Russian media market. As the predominantly Ashkenazi operatives in this transnational syndicate staged privatization frauds, the Russian public endured a dramatic five-year decline in life expectancy among men, the most dramatic reversal in human welfare recorded in a developed nation other than in wartime. At least 12.5 million men “disappeared” in the former Soviet Union due to suicide, alcoholism, a failing healthcare system and destructive behavior. Life expectancy in Russia fell to 66 years, 14 years below the European Union average. As yet, no one has proposed how to factor such costs into the oligarchization of Russia. Nor has anyone explained why a candidate for the U.S. presidency would protect those who financially pillaged Russia unless his candidacy enjoys syndicate support—or unless he considers oligarchies consistent with democracy and market capitalism. As poverty swept a nation never known for its prosperity, Khodorkovsky and his colleagues undermined the Russian tax base by shipping Yukos oil to a tax haven at a small markup and paying tax only on the difference. The oil was then sold at world prices and no tax paid on the real profit. When, in response, lawmakers sought to raise taxes on the oil sector, he blocked the legislation by using his tax savings to fund opposition political parties. Khodorkovsky’s deep-pocket philosophy of democracy bears a striking resemblance to the McCain-Feingold campaign finance reform that allows America’s well-to-do to invest unlimited amounts in their pet political projects. Had McCain’s reforms been operative in Russia, Khodorkovsky could have funded his political opposition to tax reform through tax-exempt 527 organizations, all the while citing freedom of speech, freedom of the press and even freedom of religion by portraying as anti-Semitic anyone who opposed his political campaign. While ordinary Russians were coping with the effects of this criminality, Khodorkovsky was negotiating the sale of a large block of Yukos shares to ExxonMobil or ChevronTexaco and proposing to use the proceeds to fund his own presidential campaign. If successful, Russia’s “piratization” would have financed in Russia an Ashkenazi-oligarch system of governance with wealth defrauded from the Russian public. Yeltsin predecessor Mikhail Gorbachev charged in July 2005 that $1 trillion had been hidden abroad by those “plundering” Russia. The facts suggest the total may be considerably more. Brezhnev’s daughter was having an affair with a circus clown who was also a diamond smuggler while her husband, Yuri Churbanov, deputy head of the national police, was on the payroll of the Uzbek Mafia. Even more amazing, the head of the Uzbek criminal organization paying Churbanov was Sharal Rashidev, who in his day job was the Secretary, or leader, of the Uzbek Communist Party. No wonder few of the efforts to attack crime in the waning days of the communist era were successful. Why does an aspirant for the White House (John McCain) allege that those countering this criminality are mounting “a creeping coup against forces of democracy and market capitalism”? Why attack Putin while defending Berezovsky and Gusinsky? Why, unless his candidacy enjoys syndicate support, describe mega-thief Mikhail Khodorkovsky as a “political prisoner”? If not a Kremlin overseen by an Ashkenazi oligarchy, what sort of government would a McCain administration envision for the Russian people? Prior to his arrest, Khodorkovsky transferred voting control of Menatep, a Yukos holding company, to deputy chairman Leonid Nevzlin whose 2004 wealth Forbes estimated at $2 billion. Nevzlin fled to Israel shortly after Russian authorities indicted a former Yukos security chief for four murders including the death of the mayor of Nefteyugansk, a Siberian oil town at the center of the Yukos empire. Two fellow Yukos billionaires, Mikhail Brudno and Vladimir Dubov, fled with Nevzlin where they now live as his neighbors in Herzilya, an exclusive seaside community north of Tel Aviv. The Yukos security chief was sentenced to twenty years in prison for murders that Nevzlin is alleged to have ordered and Khordokovsky reportedly approved. In 2005, Israeli Prime Minister Ariel Sharon declined Putin’s personal appeal to extradite Nevzlin for prosecution on a murder charge in Moscow dating from when Nevzlin led the Russian Jewish Congress. Russian law enforcement officials claim that the murder of a city official was but one of many that Nevzlin ordered. In March 2008 the Russian government began a murder trial for Nevzlin in absentia. Moscow cites evidence that he oversaw an operation resembling Murder, Inc. that ordered the assassination of Russian business executives and officials from 1998 to 2004. Despite these charges, Nevzlin traveled freely in the U.S. after his Christmas Eve 2006 arrival in Newark, New Jersey under State Department protection championed by Congressman Tom Lantos. Nevzlin’s pro-Israeli supporters claim that the charges against him are political payback for his alliance with Khodorkovsky. Lantos assured The Jewish Week that Nevzlin is “as honest as they come,” adding, “To accuse him of murder is about as absurd as my being charged with murder.” In August 2008 a Russian court, trying Nevzlin in absentia, found him guilty of ordering four murders and attempted murders. Alexei Pichugin, the former head of Yukos security, was sentenced to 24 years in prison in 2006 for carrying out those murders. Michael Steinhardts’s father, Sol “Red” Steinhardt, was a prominent jewel fence for New York’s crime syndicate during the 1930s. He was particularly close to Arnold Rothstein, the acknowledged head of organized crime and an inspiration to Meyer Lansky who emerged as chairman of the National Crime Syndicate and its enforcement affiliate, Murder, Inc., following the 1929 crime conclave in Atlantic City. As a hedge fund operator, Michael Steinhardt paid 75% of the $70 million in civil fines required to settle a Securities and Exchange Commission/Department of Justice case in the early 1990s when he sought to corner the market in short-term Treasury notes. Steinhardt was estimated to have made $600 million on his Treasury positions. In 2000, Steinhardt and Charles R. Bronfman founded Taglit-Birthright Israel to pay for young Diaspora Jews to travel to Israel to discover their Zionism. As of May 2008, 165,000 participants from 53 countries had traveled to Israel under a program that the Israeli government sponsors by covering a third of the costs. In 2007, casino mogul Sheldon Adelson donated $30 million. He gave $36 million more in 2008. In 2007, he also contributed funds for a lavish new office building in Washington, D.C. for AIPAC. Could Vladimir Putin be seeking to protect the Russian people from any further deprivations at the hands of this oligarchy? Does he aim to correct a nationwide control fraud inflicted on Russia by a transnational criminal syndicate? Of particular concern to a fledgling democracy should be efforts by this predominantly Ashkenazi network to purchase—as it did in 1996—the presidency of Russia (or any nation) with a combination of stolen public assets and control of the public’s airwaves. Russia’s leadership can take little comfort in the fact that a similar challenge faces America, a mature democracy. In response to Russia’s systemic criminality, John McCain charged that the widely popular Russian president was seeking to “create an empire of influence and submission, if not outright control.” Future research will identify who persuaded the candidate to issue a series of similar statements. Without more facts, it is impossible to know whether he is complicit, incompetent or naïve—or whether someone in his office routinely releases such statements in his name. At the annual Munich Security Conference in February 2007, President Putin portrayed as “very dangerous” the current U.S. approach to global relations. Based on Putin’s experience with this syndicate’s operations in Russia, it is reasonable to conclude that he was referring to the influence of an unelected (Ashkenazi) government operating with impunity inside the U.S. government—as the people in between. Fields within fields. McCain campaign manager Rick Davis lobbied for Imagesat, an Israeli firm that sells satellite imagery. He also consulted to Pegasus Capital Advisors, a private investment firm with a financial stake in Imagesat. Pegasus offered Davis and his partner in the Davis Manafort firm a chance to participate in one of its investments. In November 2005, Pegasus acquired a stake in Traxys, a transnational company that trades in industrial metals, a business where Oleg Deripaska made his initial fortune by stripping assets from state-owned enterprises and selling them abroad. Aluminum was an early target. The criminal network identified in this account typically influences both sides in political contests. Davis Manfort worked in Ukraine for Rinat Akhmetov, the richest man in Ukraine and the principal financial backer of Viktor Yanukovych, the Moscow-backed candidate for the Ukraine presidency. In 1996, Davis served as deputy campaign manager for Republican Bob Dole. Both Dole and Democrat Bill Clinton used Carl Lindner-provided aircraft during their 1996 presidential campaigns. A consultant to Michael Bloomberg’s New York mayoral campaign, Davis joins others in the McCain campaign who lobbied for telecommunications companies, including Verizon, Comsat and SBC Communications—firms with a direct interest in matters before the Senate Commerce Committee, chaired by McCain in 2001 and again from 2003 to 2005. Two initial exceptions to the McCain campaign’s conflict-of-interest guidelines benefited Davis’s firm. The first allowed lobbying not in excess of a specified threshold. The second allowed lobbying overseas on behalf of foreign firms and politicians. The campaign’s ethics guidelines, crafted by Davis, were tightened only after McCain secured the nomination. Davis also draws a salary as president of the Reform Institute, a group McCain helped found to reduce “the influence of special interests” in politics and government. In marketing his lobbying services both domestically and abroad, Davis described himself as someone who has “operated at the highest level of decision and deal making.” As senior campaign manager, he controlled the use of McCain’s campaign bus, the Straight Talk Express. In early July 2008, Davis’ responsibilities as campaign manager were reduced. Revenues from Russia’s financially pillaged enterprises were recycled into corrupt privatization auctions only after rampant inflation (2,500% in 1992 alone) destroyed the savings of ordinary Russians, leaving only syndicate operatives with the funds to bid. “Shock therapy” fiscal discipline (sharp cutbacks in social spending) further ensured that only those Russians complicit in this nationwide fraud could afford to participate in purchasing the wealth of their nation. Chubais’ assessment fails to distinguish between America’s early-stage capitalists—who created great wealth—and Russia’s 20th century oligarchs—who defrauded their fellow citizens of the nation’s great wealth, plunging the most vulnerable into abject poverty. With few exceptions, those enriched by Chubais built nothing new. Oftentimes the oligarchs forced their employees to sell them the few shares they had gained in the privatization process. More than two-thirds of the top 100 richest Russians claim “self-made” fortunes from their ownership of natural resources and raw material firms that belonged to the Russian people. The mindset voiced by Chubais may be influenced by Vladimir Potanin, his neighbor in the Russian countryside. As a Kremlin insider, Potanin got an early start in this massive fraud when he created a foreign trading company to export state-owned natural resources and raw materials. His outsized profits capitalized a Yeltsin-favored bank where state enterprises and municipalities kept their cash (Potanin served as Yeltsin’s first deputy prime minister for seven months). His bank (Oneximbank) was both an originator and a beneficiary of the 1995 loans-for-shares scheme. As one of the Big Seven, he was also a major force in Yeltsin’s reelection in 1996. Through Oneximbank, Potanin acquired more than 20 firms. With a 2008 net worth of $19.3 billion, he ranks 25th among the world’s billionaires. In defending the indefensible, Chubais acknowledges University of Chicago economist Milton Friedman as both inspiration and guide for an ostensibly “legal” process that, by 2003, led to a handful of oligarchs controlling 85% of Russia’s leading private companies. Confirming that this crime is poised to continue, Thomas Mirow, the newly appointed president of the European Bank for Reconstruction and Development, announced in July 2008 the “encouraging signs” that Chubais could play an influential role in negotiating a new accord between Russia and the European Union. To orchestrate a fraud of such magnitude in plain sight required the appearance of good faith and legality along with some semblance of intellectual authority. Each of those components was furthered by U.S. Treasury Under Secretary Lawrence Summers who in the mid-1990s had just completed two years as chief economist at the World Bank. Backed by the perceived authority of those institutions, Summers dispatched to Russia a handpicked advisory team from Harvard University that lent this larceny the appearance of good faith legality and academic legitimacy. Associating this systemic criminality with Harvard’s historic credibility eased the enactment of legislation required to perpetrate fraud under the authority of law. The Harvard team of predominantly Ashkenazi advisors crafted much of the legislation (at the request of Chubais) that enabled the oligarchization to proceed “lawfully,” in plain view and with impunity. With Yeltsin’s re-election, the Ashkenazi-ation of Russia gained the legal protections allowed private property in post-Soviet Russia even as the perpetrators moved much of their ill-gained wealth out of the country. While syndicate operatives were stripping assets from the Russian economy and impoverishing the Russian people, Yukos CEO Mikhail Khodorkovsky was modeling his Open Russia foundation after Open Society activities funded by George Soros in Eastern and Central Europe. Research suggests those activities provide Soros a handy means for gathering in-country intelligence while recycling his hedge fund profits back into his “pro-democracy” operations. Open Society operations also offered this Hungarian-American investor a plausible reason to insist on an early presence in post-communist economies—in plain view, with protection of the authority of law and under cover of democratic principles. As in the U.S., the openness of democratic societies became the means by which duplicity could operate with impunity in plain view. John McCain describes himself as a strong supporter of Ukrainian Viktor Yuschenko whose “Orange Revolution” presidential campaign of November 2004 gained worldwide media coverage as Kiev became a rallying point for pro-democracy groups. Such groups are now under attack as officials fear they incite crises to catalyze regime change. Soros-funded Open Society efforts joined forces in Ukraine with the National Democratic Institute (NDI), a government funded U.S. operation chaired by Madeleine Albright, former Clinton administration Secretary of State. Also active in the Ukraine was NDI’s Republican counterpart, the International Republican Institute—chaired since 1993 by John McCain. Both organizations are taxpayer-financed through a neoconservative-favored project known as the National Endowment for Democracy. The Endowment’s activities are coordinated with the State Department’s Agency for International Development. The role played by those organizations in Ukraine’s presidential election helps explain why nations are reasserting their sovereignty to resist this form of foreign intervention. Often that resistance involves charges of outside interference by the U.S. to incite riots and work stoppages and encourage coups d’etats A guilt-by-association modus operandi utilized in this election suggests a pro-Israeli rather than a pro-democracy agenda, and points to a nontransparent motive. In a high-profile election in this widely watched venue, dioxin poisoning disfigured the face of Yushchenko, Ukraine’s pro-democracy presidential candidate. Widely published before-and-after photos of the handsome Orange Revolution candidate made Viktor Yanukovych, the Moscow-backed opposition, appear “ugly” by comparison—and guilty by association. 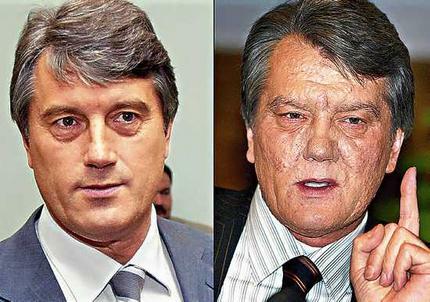 Viktor Yushchenko March 28, 2002, left, and Dec. 6, 2004, right. With sustained media coverage, that poison-induced power of association evoked the dark ghosts of Russia’s Stalinist past. News reports routinely referenced a 1978 incident when a ricin-poisoned pellet was fired from a pneumatic umbrella into the leg of Bulgarian dissident Georgi Markov on London’s Waterloo Bridge. Markov died four days later. As news reports repeatedly referenced the Markov incident, the Moscow-backed candidate was discredited. The poisoning of a popular presidential candidate also fueled the plausibility of a resurgence of a Cold War conflict of opposites – pro-democracy vs. pro-Moscow. In that media-stoked morality play, the disfigured Yushchenko was cast as the freedom-seeking hero victimized by Moscow’s Evil Empire, and featured a steady stream of references to Putin’s suspect past as a colonel in the Soviet-era KGB. Specialists in exotic poisons know that dioxin is generally not deadly. Its defining property is its capacity to create disfiguring cysts on the upper torso. The evidence suggests that the poisoning worked its intended effect on the candidate, on the election and on politics in the region. After his election victory Yushchenko soon proved that he was both corrupt and incompetent. By September 2005 he had sacked his entire coalition government when its own members accused one another of corruption and cronyism. He acknowledged that ordinary Ukrainians had come to see the Orange Revolution as a means of transferring wealth from an old to a new elite. Ukraine has since endured a series of unstable power-sharing arrangements. With Yushchenko’s approval, Nathaniel Rothschild, in line to become the fifth Baron Rothschild, is now prospecting for oil in Ukraine. Mikhail Fridman, a Russian Ashkenazi oligarch born in Ukraine, founded Alfa Group in the 1990s as a commodities trading firm whose shadow economy profits enabled him to capitalize Alfa Bank, one of Russia’s largest, along with a conglomerate with interests in oil, telecommunications, electricity, chemicals, pharmaceuticals, cement, glass, construction and retail sales. His role in the 1995 loans-for-shares fraud enabled him to later merge TNK, an oil company he controlled, with British Petroleum to create TNK-BP, Russia’s third largest oil producer. In 1996, Alfa Bank also reaped large profits on government treasury bills. As one of the original Big Seven bankrollers of Yeltsin’s 1996 re-election campaign, Fridman joined an elite group who then “controlled half of Russia’s economy” according to former Security Council Deputy Secretary Boris Berezovsky. Though Berezovsky exaggerated, it would be accurate to say that 20 oligarchs controlled half the Russian economy. Both Berezovsky and Fridman owned a stake in ORT television, a major media outlet that backed Yeltsin’s re-election. Forbes ranked Fridman 20th on its 2008 list of the world’s billionaires with a personal net worth of $20.8 billion. With a personal wealth of between $5 and $10 billion, Victor Pinchuk is Ukraine’s second richest oligarch. Married to the only daughter of Leonid Kuchma, Ukraine’s former president, Pinchuk describes George Soros and Bill Clinton as his friends as he became a donor to the foundations of both. Soros called him an “enlightened capitalist” as Pinchuk acquired a $160 million London estate and financed programs in Washington at the Brookings Institution. John McCain’s conduct suggests he is naive about how unconventional warfare is waged by the people in between. The timing of the high profile poisoning in London of Alexander Litvinenko in November 2006 should have raised McCain’s suspicions as an ex officio member of the Senate Intelligence Committee. Alarms should have sounded when media reports immediately sought to link the murder of a former KGB colonel (Litvinenko) to former KGB colonel Vladimir Putin—with no plausible motive for Putin to order such a murder. Rather than kill Litvinenko quickly and quietly, did the people in between stage that “theater of assassination” for a strategic purpose? Why then? Could it be because President Putin was then engaged with members of the Quartet (Russia. the U.S., the European Union and the U.N.) to end the 40-year Israeli occupation of Palestine as an essential step toward stability to the Middle East? From a game theory perspective, it would have been perfectly predictable that Litvinenko’s murder would create friction between two key players—Russia and the U.K.—and distract the leaders of both (aka entropy). During the first week of December 2006, an analysis of this Putin-discrediting, power-of-association entropy strategy (titled “Khodorkovsky’s revenge”) was distributed widely, with a copy to the Russian embassy. Who, if not the syndicate profiled in this account, had the means, motive and opportunity to murder Litvinenko in London? Two days after Khodorkovsky lieutenant Leonid Nevzlin arrived at Newark airport on Christmas Eve 2006, Russian Prosecutor General Yury Chaika issued a press release identifying Nevzlin as a murder suspect in the Litvinenko poisoning and seeking his extradition. Litvinenko met with Nevzlin in Israel just weeks before his death. Former KGB Colonel Alexander Litvinenko, photographed at his home in London May 10, 2002. (AP Photo/Alistair Fuller). 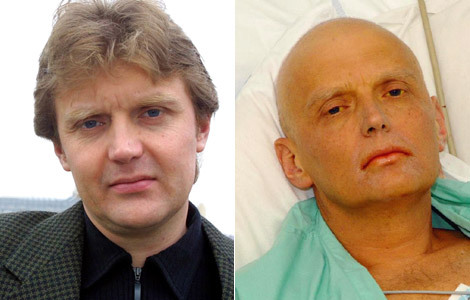 Litvinenko photographed in London hospital, November 20, 2006 (Getty Images/Natasja Weitsz). By early January 2007, Time Warner had bought the rights to a film version of the Litvinenko murder that will be produced by Hollywood star Johnny Depp and in which he may play the lead role. In mid-January 2007, Chaika protested the refusal of U.S. authorities to extradite Nevzlin, citing the principle of reciprocity between law enforcement bodies. When Nevzlin traveled to the U.S. in July 2005, he criticized Putin in a Yukos-related Helsinki Commission briefing where he urged that Russia be expelled from the G-8. Tom Lantos and John McCain championed Nevzlin’s proposal in the Congress. Why would a candidate for the American presidency advocate a proposal by a Russian fugitive complicit in international organized crime and reportedly active in a Russian version of Murder, Inc.? Throughout the Litvinenko incident, London-based oligarch Boris Berezovsky continued to plead his innocence in the murder in London of a man who had worked for him. Litvinenko also provided testimony that helped Berezovsky persuade British authorities that the godfather of the Kremlin merited political asylum. Litvinenko assured Whitehall that the Kremlin (i.e., Putin) had ordered Berezovsky’s murder. While Litvinenko was slowly dying, Berezovsky funded a public relations campaign to inject Putin-discrediting storylines into the global media marketplace. Moscow wants to bring Berezovsky to trial for fraud and embezzlement. Berezovsky’s hatred for Putin remains palpable as evidenced by the funds he invested in a guilt-by-association public relations campaign that sought to link Putin to the Litvinenko murder. Media outlets used the murder as an opportunity for another flurry of stories claiming that Khodorkovsky, like Litvinenko, was the victim of an abusive state. From Tel Aviv, Nevzlin funded an anti-Putin public relations campaign that ran parallel with Berzovsky’s campaign from London. Was this high-profile murder with an atomic-age poison (polonium-210 is deadly in microgram amounts) meant to reinforce another mental thread: the threat of Iran’s nuclear program? The choice of murder weapon is consistent with the power-of-association modus operandi chronicled throughout this account. Was the associative effect meant to reinforce the threat of nuclear terrorism? That associative “bleed-over” sought to discredit Putin while portraying Eizenstat’s client as the hapless victim of an oppressive state reverting to its Stalinist past. Like a toxic fog, hints of anti-Semitism hung ever present in the background, intimated but never clearly stated. Had that accusation been made, might an inquisitive public have realized that history’s greatest heist remains largely an Ashkenazi operation? Berezovsky is the apotheosis of sleaziness on the state level; this representative of a small clique in power is not satisfied with stealing—he wants everybody to see that he is stealing with impunity. Unless John McCain enjoys the support of this transnational syndicate, why would he join Tom Lantos, Joe Lieberman, Boris Berezovsky and Leonid Nevzlin in an effort to discredit Russia’s leadership? Berezovsky first mastered the ability to strip state-owned assets (oil, timber, aluminum), avoid taxes and hide that wealth offshore—the root cause of the destruction of the ruble. At Avtovaz, the most mobster-ridden of any large Russian company, police identified no fewer than 65 contract murders involving Avtovaz managers and dealers in a firm where Berezovsky wielded substantial influence. His control fraud at Aeroflot offers a case study in how an oligarch could loot a company without owning it by directing 80% of the airlines’ global revenues to foreign accounts that he controlled. His grasp of labor racketeering was on display when he financed a miners’ strike and bragged about it as he profited from the conflict. His corruption of Russian media was legendary, particularly in rigging Yeltsin’s re-election with the help of media oligarch Vladimir Gusinsky. After he and Gusinsky raised Boris Yeltsin from 10% approval to a 1996 election victory, Yeltsin appointed him deputy secretary of the Security Council. He then financed Chechen organized crime by arranging ransom payments for kidnappers while simultaneously discrediting (and endangering) the entire Chechen people. When Chechen President Aslan Maskhadov announced that Berezovsky was financing organized crime, one month later, in December 1997, the severed heads of four kidnapped British telecom workers were found lined up on the side of a highway in Grozny. A master of the technique of waging war through the people in between, Berezovsky was notorious for appointing agents of the oligarchs to government staffs. Following his appointment to the Security Council, Izvestia revealed that Berezovsky was both Israeli and Russian. After repeated denials, he was forced to admit that he held an Israeli passport, declaring, “Any Jew in Russia has a double citizenship”—a comment that outraged Russian Jews loyal to Russia. Berezovsky then complained that he was the victim of “a rising tide of anti-Semitism.” If not for that claim (and his stolen fortune), why would the British grant him asylum? Why would a candidate for the U.S. presidency support a gangster whose behavior turned democracy into a profanity for ordinary Russians? Berezovsky’s blatant criminality played a key role in discrediting both markets and democracy. Russians now speak of privatization as “grab-it-ization” (prikhvatizatsiya) and refer to democracy as “shitocracy” (dermokratizatsiya). Americans should be concerned when a presidential candidate lends his support to key figures in transnational organized crime. The Russian experience confirmed that this global syndicate is masterful at committing nationwide frauds by corrupting a nation’s lawful authority, including the office of the president—as with “asset” Boris Yeltsin, a notorious alcoholic. With the pro-Israeli bias of mainstream media, the political environment—both in the U.S. and abroad—is ripe for frauds on an unprecedented scale. As in Russia, those frauds include a presidential election in which the public’s airwaves can be deployed to induce Americans to believe that a candidate would put America’s interests first—despite what the confirmed facts suggest. Media and Nonlinear Criminality. In the course of a July 27, 2008 interview with CNN’s Wolf Blitzer, presidential candidate John McCain agreed to answer several call-in questions. Without identifying the caller, Blitzer asked, “If you were president, would you move the U.S. embassy from Tel Aviv to Jerusalem?” McCain immediately answered “yes.” Blitzer then clarified his answer by asking, “Like, as soon as you were inaugurated, right away, you would order the State Department to do that?” McCain responded, “I’ve been committed to that proposition for years.” The next morning Prime Minister Ehud Olmert announced it was unlikely Israel and the Palestinians would reach a peace accord by the end of 2008, considering the volatile issue of Jerusalem.